Presto 11" Electric Skillet with glass cover. Roasts, fries, grills, bakes, makes casseroles and more. Doubles as a hardy buffet server. High sidewalls and a tempered glass cover make this skillet ideal for breakfast, lunch, dinner and entertaining. Heavy cast aluminum base is virtually warp proof. Saves energy - it is more efficient than using a range burner or oven. Fully immersible and dishwasher safe with the heat control removed. 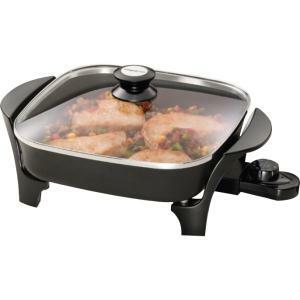 Deluxe nonstick surface, inside and out, for stick free cooking and easy cleaning. Control Master heat control automatically maintains the desired cooking temperature.